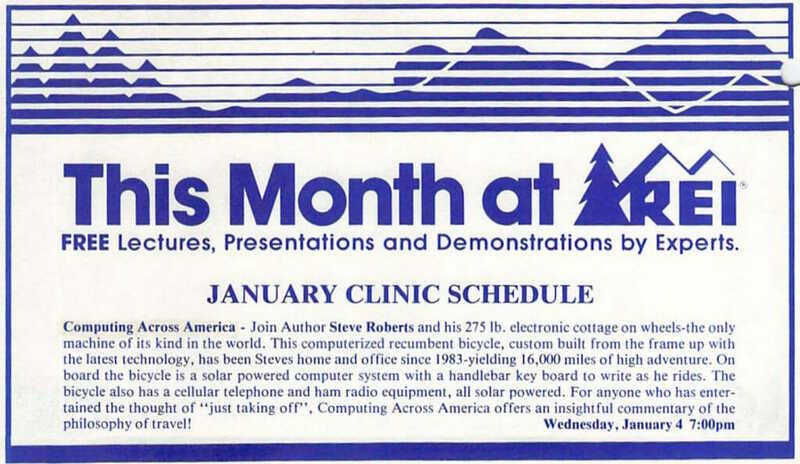 Computing Across America – Join Author Steve Roberts and his 275 lb. electronic cottage on wheels—the only machine of its kind in the world. This computerized recumbent bicycle, custom built from the frame up with the latest technology, has been Steve’s home and office since 1983—yielding 16,000 miles of high adventure. On board the bicycle is a solar powered computer system with a handlebar keyboard to write as he rides. The bicycle also has a cellular telephone and ham radio equipment, all solar powered. For anyone who has entertained the thought of “just taking off,” Computing Across America offers an insightful commentary of the philosophy of travel!